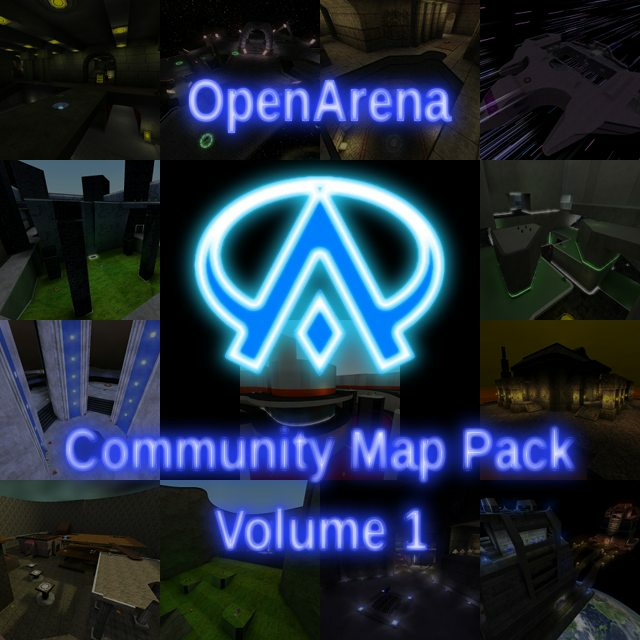 OpenArena Community Mappack Vol. 1! The OpenArena Community Mappack (also called OACMP) is a mappack containing GPL'd maps made by the community itself. The idea is to give GPL servers something else to play aside of the official maps and the already GPLv2'd maps. This idea started in the official OA forum. Anyone, as long as they respect the rules of the mappack, could be part of the DevTeam for this pack. They don't even need to be mappers, even if they can't produce assets, this doesn't mean that they can't test the maps themselves and give feedback. The style of the map was up to the mappers themselves, with the only important restriction being that everything must be GPLv2'd, like OA itself. Over the course of a year and a month and a half, the Team worked very hard in this pack. The result is 13 high-quality maps, 10 FFA-oriented and 3 CTF-oriented, from 4 authors and a plethora of collaborators. Bundled with the pack is a mod which adds the OACMP FFA maps to the Single Player Deathmatch/Unlock Tiers mode. It (like the pack itself) requires OpenArena 0.8.8 in order to work. The installation is as simple as "unzip everything in your OpenArena directory with routes enabled". With all of this said, we hope you enjoy the pack as much as we enjoyed making it! Should I move this now? Neon_Knight - OACMP coordination, bugfixing. Gig - OACMP coordination, mapping, textures, sounds. Akom74 - Mapping, textures, sounds. pelya - Test server, bugfixing. Fixed, I guess. I've moved the maplist and credits to a post below, and used SMF's own bbcode to resize the main image. Thanks for what you have done here with this project for the OA community. Really really really really nice!!! 13 cool new maps... I appreciate the hard work you have had with this nice contribution and ofc it has been all worth it. Thank you very much. Pelya's game server seems to still be runnung RC version. Could you please update it to the final version? Thank you very much!!! You could do better by sending a PM to him. Moved the download mirrors to another post. The pack is spreading very fast. Already done. He said he should do tomorrow, using baseoa this time. I'll update the server today. Which mode should I choose for team maps? I would prefer DD, but CTF seems to be more well known. Also, several maps will be duplicated in both FFA and DD modes, but I don't think that's an issue. BTW I've found a bug in our dedicated server code - when user successfully votes for map, the map rotation script becomes disabled, and the map stays selected until the server is restarted. I'm too lazy to fix it right now, but we should probably tell Sago007. Congratulations to all the developers / artists who created this pack and its maps! I don't write in this forum very often but I wanted to thank you for your efforts. I should have asked this earlier, but I noticed that the pack uses xcsv textures. Aren't they CC BY-NC-ND 3.0? Souldn't they be removed or replaced due to making the package nonfree? You may be talking about the xcf textures. The pack itself doesn't use them. The xcf textures are GIMP files, and are in the pack for GPL compliance reasons. EDIT: Wait a minute. Give proof of that. the textures are in textures/xcsv/ in the pk3. And the offender filename/texture is? Oh, crap... this is why I am extremely reluctant to do GPL audition and wanted someone else to do it. Danfun64, THAT KIND OF THINGS SHOULD HAVE BEEN REPORTED EARLIER. Pulling the pack out. From anywhere I can.